Every time I return from a trip, I have great intentions of creating a super mini dedicated to said trip. Never happens. I have several boxes full of photos and travel ephemera dating back to the late 90's. Maybe one day I'll get to those. I'm going to switch things up a bit and document while on my trip. I don't plan on spending hours working in this book while I'm away. I want this to be a quick and simple process...something I can work on with the downtime we'll have which will be a fair amount since my traveling companion is an almost 4 year old. I'd also like to note that before assembly, I searched Pinterest for travel journal ideas. 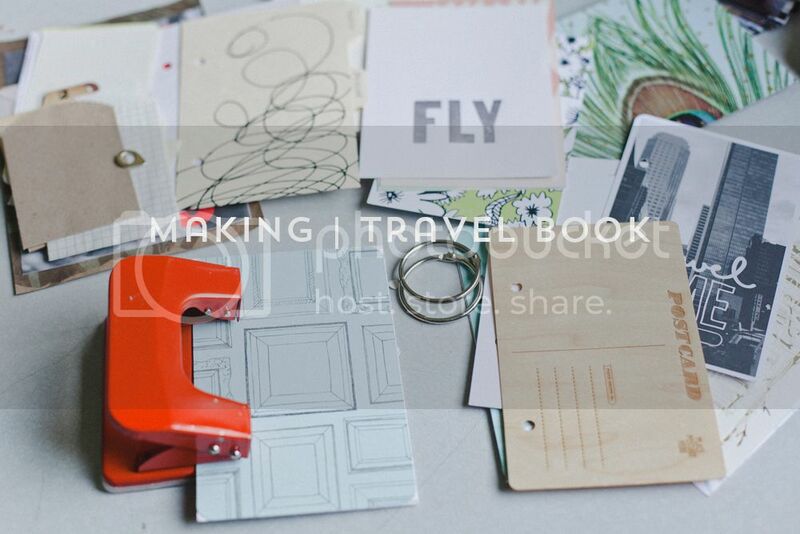 Lot's out there but Kelly Purkey's travel binder really sparked this idea of creating on the road. Here's the construction of the book. 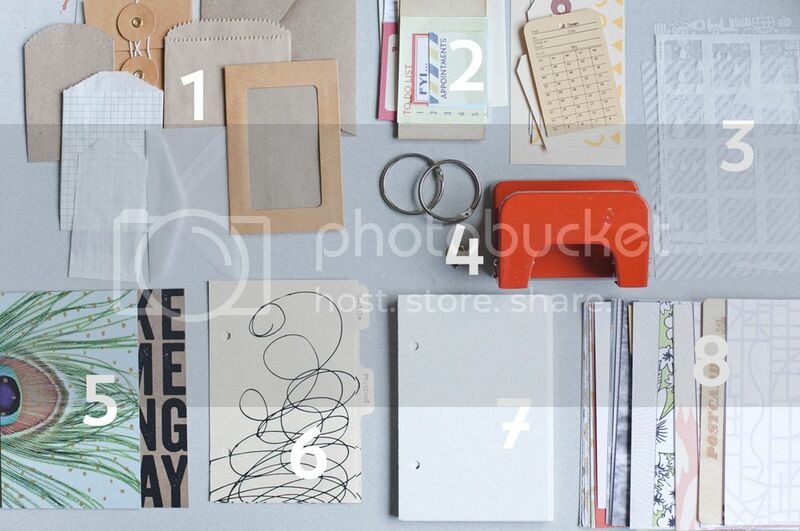 1. envelopes and pockets are essential since there will be lot's of ephemera and found objects. Collecting is the best part of traveling! 2. fun post its and tags. I'll use these as journaling spots. 3. overlays. because why not? 4. hole puncher + d rings. I thrifted the hole puncher the day after I read KP's travel binder post. The thrifting/crafting gods were on my side that day. 5. cover pages. both are LLP screen prints that were cut down to fit. I thought about making the cover slightly larger to hide the index tabs but I liked having them be even with the pages which measure 4x6. 7. watercolor paper. I plan on bringing a waterbrush and Neocolor water crayons with me just for fun. 8. inside pages. I knew that I wanted to use up some of the excess 4x6 Project Life cards from past Studio Calico kits in this book. I went through my stash and picked patterns and colors that fit the mood of our destinations. I plan on adhering Instax photos and journaling on these cards. I'm still adding in things and finishing it up and trying to find some type of packet/bag/box to hold the journal and the few supplies I plan on bringing. That will be part of 2! How do you go about documenting your travels? Do you take this approach of documenting on the road or do you bust out all your findings once you're home?